Lamber, Bernard S. G 36 not found On 2/23/1864 he mustered into "G" Co.
Lange, William A 38 not found Per ACWRD discharged 3-23-1862; no other information available. Langfitt, John W A 21 Washington Co., Taylorstown PA Beaver Co., PA June 25, 1843 21-Apr-1909 Claysville PA not found Leg taken off 3" below knee; per ACWRD, first man wounded at Spottsylvania CH; also POW June 30, 1862 (place unknown). Lanham, Benj. G. F 18 dark 5' 4 1/2" brown brown laborer Pollock Twp., Pa. Fayette Co. PA Feb 22, 1847 22-Sep-1911 Kansas City MO Not Found X Per ACWRD, birth info and death info; hurt (date not stated) jumping off a train in Meade Station, VA-hospitalized; lived on Myrtle St. Kansas City after war. 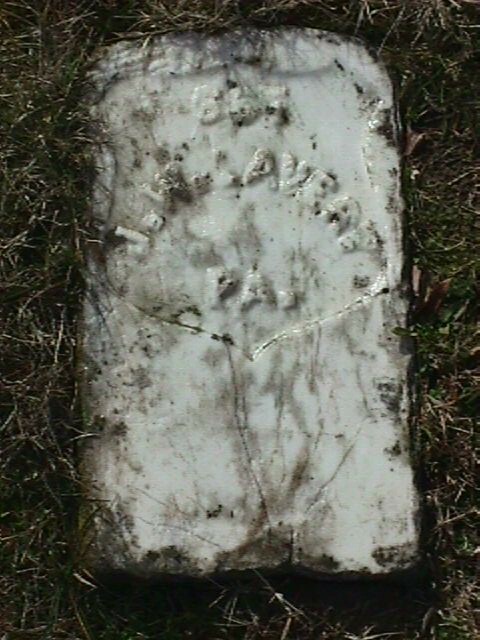 Lape, Michael M 32 1830 Jan 9, 1896 Allegheny Co. PA 104961214 Per ACWRD, On 9/5/1861 he mustered into "M" Co. He was discharged for disability on /6/1865; (Sick, on steamer "West Point" when it sank in Potomac, Aug. 13, 1862); no service informatrion on findagrave page but confident it is same soldier. Leary, Jacob C 20 boatman June 16, 1862 James Island SC not found Per ACWRD Killed at James Island SC 6-16-1862. Leasure, George M. A 30 1904 not found death date per ACWRD; 1864 draftee. Leslie, Robert C. H 26 12-Aug-1900 not found Per ACWRD, on 8/31/1861 he mustered into "H" Co.
Lewis, John M 20 Bradford Co, PA 14-Apr-1905 not found On 12/13/1864 he was drafted into "M"
Lewis, Simon W. A 22 not found accidentally died (date not stated) per ACWRD. Lewis, William H. A 22 not found Deserted Dec 12, 1862. at time of Fredericksburg battle. Liggett, Addison A 18 7-Sep-1910 not found Per ACWRD, lived in Lyon Co. KS. Lightner, Jesse H 25 Mercer Co.,West Middlesex 24-Aug-11 not found On 8/31/1861 he mustered into "H" Co.
Limber, Francis M. G 27 Dec 14, 1878 Pittsburgh PA 13278618 Caught alligators with Ira Kitch (last column of newspaper ~1/3 down) On 8/31/1861 he mustered into "G" Co.
Lindley, Henry H. A 23 Feb 14, 1864 Camp Nelson KY X 920658 On 5/27/1863 he mustered into "A" Co.
Lindsey, John F 20 30-Jan-1908 81009213 Per ACWRD, 1865 draftee. Lindsey, Samuel I 54? 1806 Jan 29, 1885 Delaware Twp; Mercer Co. PA not found On 8/31/1861 he mustered into "I" Co.
Linsley, Elijah A 48 not found Per ACWRD, "Lindsey"--discharged 4-19-1862; no other information available. Linton, Robert F 22 farmer Princeton, Pa. Feb 17, 1864 Knoxville (Nat Cem) TN X 2970297 Grave 41; per ACWRD burial record July 11, 1864. Lock, David W. G Butler Co., Marion PA New Castle, PA 1844 23-Mar-1905 Harrisville PA not found Per ACWRD, On 8/31/1861 he mustered into "G" Co. Lock, James C. E 19 carpenter Lawrence Co. PA April 2, 1842 12-May-1912 Soldiers Home TN 924160 Excerpt from "Reminiscences of the Civil War" by Confederate General John B. Gordon lost leg Aug 29, 1862 per Oct. 15, 1884 reunion photo; Per ACWRD settled at Johnson City, TN; also lived in Athens, TN; also birth date/location. Lock, John E 22 light 5' 10" grey light carpenter Venango Co. PA Lawrence Co. PA April 5, 1837 7-Jun-1915 Clintonville PA not found Wounded at 2nd Bull Run (right foot), 8-29-1862; wounded at Spottsylvania CH 5-12-1864 (left foot). Lock, William E 19 light 5' 10" grey fair farmer Penna. Feb 23,1864 North Liberty PA not found Per ACWRD, died of disease (small pox) caught at Crab Orchard, KY while coming home on furlough. Logan, Robert C 56 carpenter 1798 Sept 18, 1862 Newport News VA 93409336 No other information found per ACWRD; per findagrave.com listing, enlisted at age 64! He and Amos Martin of Co. I were likely oldest soldiers in the regt. Love, Hugh C. B 22 1886 Not found Mustered out with company July 24/65, death year per ACWRD info. Love, Robert B 40 Hitchcock SD after 1890 Not found Discharged Feb. 27/63 for disability; no other info found--ACWRD. Lowden, John M. E 22 light 5' 7 1/2" grey sandy Toeman Ireland 1840 July 30, 1864 Petersburg VA not found killed per Oct. 15, 1884 reunion photo. Per ACWRD, top of head blown off by same shell that killed Lt Richard Craven, Co. K at Battle of the Crater, July 30, 1864. Lowrie, James A 23 Dec. 29, 1861 Beaufort SC not found died of typhoid pneumonia. Lowry, Peter K 27 Montgomery Co. National Mil Home OH 21-Jul-1909 OH not found On 2/15/1864 he mustered into "K" Co.
Loyd, Martin F 19 1844 2-Feb-1922 Okolona MS X 27253535 Per ACWRD, severe wound at Fort Stedman 3-25-1865, right arm amputated; 1865 substitute mustered out with regiment; per findagrave, middle name "Hutson", no service information on grave. Lucy, George M 33 not found On 9/14/1861 he mustered into "M" Co.
Lusk, Robert I 43 89656478 On 8/31/1861 he mustered into "I" Co.
(date and method of discharge not given) (No further record); per findagrave.com, listing shown is worth looking into as birth date is very close to enlistment age and individual is shown with birth in Pennsylvania, death in Kentucky. Lutton, Cornelius F 26 farmer Eastbrook, Pa. 27-Mar-1905 Leanderville AL Not Found No additional information found. Lyner, Richard H. G 18 Pennsylvania 7-Sep-1924 Santa Barbara CA not found Starr King GAR Post #52 On 8/31/1861 he mustered into "G" Co.
Lyon, James F. D 21 farmer not found Per ACWRD, 1861 volunteer--no further information available. Lytle, Samuel M 43 not found On 9/23/1861 he mustered into "M" Co.